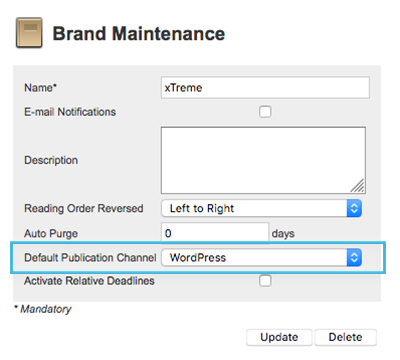 This article describes how to set up a Publication Channel in Enterprise Server 10 for publishing content to WordPress. Step 7. From the Publish System	list, choose WordPress Publishing Connector. 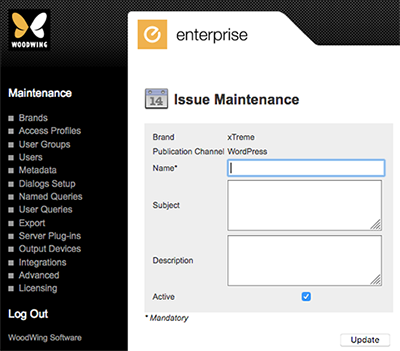 Note: This option is only available when the WordPress Enterprise Server plug-in is installed and enabled. Step 8. (Optional, only when the auto-complete feature for tags is going to be used. See Linking WordPress tags to a Suggestion Provider). From the Suggestion Provider list, choose the provider for suggesting tags. Step 15. (Optional, only when using the Previous and Next issues feature). Make sure that the order sequence for the created Issues is correctly specified. Step 18. (Optional, only if multiple Publication Channels have been created) In the list named Default Publication Channel in the gray section at the top of the page, set the Publication Channel that should act as the default Channel. This could be the WordPress channel or any other channel. Click Update to save the change.